Today we are lucky enough to have Denisse with us Guest Blogging - she is an amazing person who was willing to share with us all her story. Please take a moment to read her post and feel free to leave comments in response on our Facebook page. I was in conflict with my own grief. I was unsure if the pain that I was feeling was somewhat exaggerated or if the people around me truly didn’t understand my loss. I didn’t plan my pregnancy. In fact, I didn’t even think I would get pregnant. Having PCOS -(Polycystic Ovarian Syndrome) and not being on any medications it was almost an impossibility. It had been 2 years since my doctor and I had decided that I would manage the disease with diet and exercise rather than medications. It didn’t even occur to me that my menstrual cycle had been regulated for the first time in over 20 years without the use of birth control pills. I felt my body changing. But I had no idea what the change meant. I assumed that the tenderness in my breasts and my lack of energy came from the constant working out I had been doing at the gym and that my body was warning me of my period. But a week had gone by and no period. So I decided to humor myself and take a home pregnancy test. I ran the test before my shower and had even almost forgotten that I had done it. But when I grabbed the test it was positive. I didn’t even know how to feel. A surge of emotions came over me. I was happy and excited, shocked and scared, smiling and crying. And there it was, that feeling of motherhood I had totally erased from my mind as anything I would ever actually feel. The next few weeks I spent on the phone with my mom and my younger sister. I wanted to share every bit of happiness with my mother because for the first time I felt as though we had something in common. And I spoke to my sister almost daily but it was more for comfort over every cramp I felt. I can laugh now because I see how subtle she was in reassuring me that everyone experiences these minor pains. She would even send me links as to comfort me. She even had me sign up for a website that would send me weekly emails on the progression of my pregnancy. When it was time for my first ultrasound I was excited. I had already read that my baby’s heart had been beating for over 5 weeks. Now it was time to finally hear the heart of the baby that had been growing in my womb. It felt like it weighed as much as a baseball even though I knew it was a lot smaller. But something else happened that day. I didn’t hear my baby’s heart. In fact, I didn’t even look at the screen to ever see my gift from God. Although, there was nothing but loud cries and worry and pain coming from every part of my body, there was nothing but silence in the room. I couldn’t tell. The body language to every doctor in the room was so loud it burned through my skin. And in the midst of all the chaos, the only person whose eyes met mine and totally understood what I was feeling was his father. I sunk into his chest and just cried. It had been 2 weeks since my baby had stopped growing. And even then I felt like I was a bad mother because I didn’t even feel the change in my body. Sometimes I think back to those days and wonder about every movement, every jump, every hard laugh, and I wonder, did I know? The worst part came in the months to come. After they had successfully removed my baby I had to come back to reality. With so much going on in my own life I had to move from New York and back home to Boston. I was closer to my family but further away from the man that had given me such a blessing. The coping became difficult because I felt as though I had to be strong. Even when I cried about how I felt to my sister it was as if I was left to grieve on my own because I wouldn’t even get a hug to be comforted. I didn’t know who to turn to. The father hadn’t really wanted the baby so his concern wasn’t in comforting me all the time, my mother would talk to me but I knew she couldn’t comfort me from Puerto Rico. I prayed, I wrote, I meditated. I did everything I thought a woman should do after a loss in order to remain strong. But the truth was, it was eating me up inside and I didn’t even know it. It wasn’t until someone began to say mean things to me about only having the memory of a dead baby that I began to feel the sharpness of m pain. And it was so strong that it began to destroy every bit of strength I had in me and I began to cry out for understanding, or better yet, a hug. So I began to write. I wrote and I wrote all the pain away. And for the first time, I put it on my blog and released my pain to the universe. I did it with the purpose of liberating myself of the pain, and in turn, God sent me the biggest blessing; women. I connected with women who had suffered loss, women who were still grieving, women who were talking and grieving together. I was able to find websites from women all over the world who connected with me via Twitter and Facebook after they had read my story. I received so many warm and encouraging words that helped me through the next days and weeks to come. The most beautiful gift came from a woman in Colorado who had suffered the loss of her grandchild as a result of a miscarriage and has since become an advocate for grieving mothers. 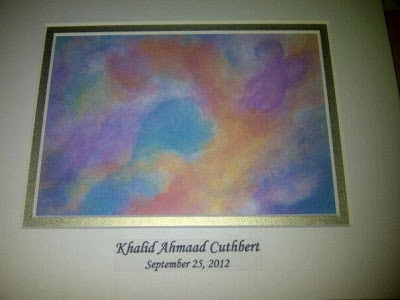 She sent me a painting in a small frame with my baby’s name on it. It was the first time I had actually seen his name printed and for the first time in months, my baby was significant. I can’t say that I am healed yet. It hasn’t even been a year since my loss. But as I celebrated my due date this past month I realized that healing isn’t exactly what I am supposed to do. My experience, along with that of so many other women, has a purpose. As I continue to meet more and more women who have their own stories, I know that my baby has a legacy as well. 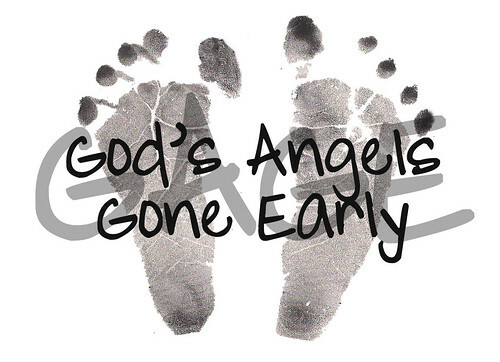 Because of my angel, I have a story to share. I have words of encouragement for other women. My grieving is no longer a closeted process. As I choose to grow in my life, I have embraced my experience and I am learning how to integrate it into my life as part of my journey. And because of that decision, I am glad that God has given me my strength back. I am glad to have the people in my life that I can openly express myself to when I have to and now they understand, to a degree, that the significance my child had in my life, is one that no one can ever take from me. But most of all, I am most grateful for having a voice. I thank God that I can share my story and that I can smile knowing that even if I never experience motherhood to the fullest extent, I will always have my angel. And because of him I am able to comfort and guide other women towards healing in their lives as well. In loving memory of Khalid Ahmaad Cuthbert and all the other angels in our lives.